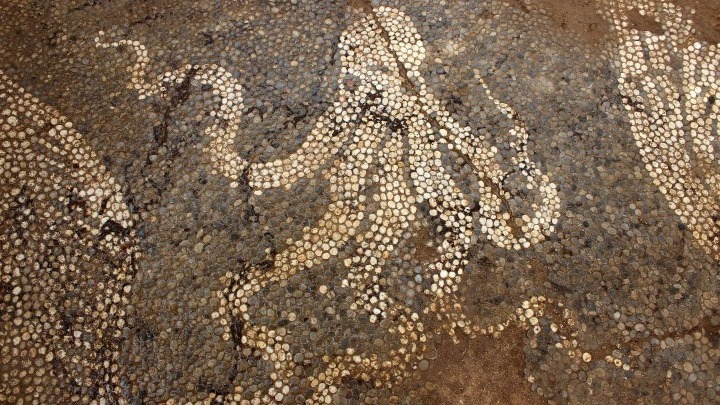 A pebble mosaic in a bathhouse dated to the 4th century BC was unearthed during an excavation at the Small Theater of Ancient Amvrakia conducted recently by the Ephorate of Antiquities in Arta, ANA reports. The round mosaic consists of small white, off-white and dark river pebbles showing scenes related to water. Besides a border decoration setting it off from other spaces, it features cupids playing with animals, swans, fish, water fowl and an octopus. The pebble mosaic is earlier than the theater, and is related to a similar mosaic found in the '70s, partly covered by the eastern part of the theater and later removed to the Archaeological Museum of Arta. In a press statement, the Arta ephorate said the dating was based on architectural evidence and on comparisons with pebble mosaics found at the Ancient Corinth baths, dated to the mid-4th century. The supervision of the excavations is carried out by archaeologist Nektarios-Petros Gioutsos and three conservators have already taken measures to preserve and stabilize the new find. Arta, in western Greece, has been inhabited continuously from antiquity to the present, and the layered remains of older settlements are still visible in various parts of the present city. The Small Theater is situated in the center of the modern city. The excavation is funded by the EU's NSRF funding plan for 2014-2020. Arta (Greek: Άρτα) is a city in northwestern Greece, capital of the regional unit of Arta, which is part of Epirus region. The city was known in ancient times as Ambracia (Ancient Greek: Ἀμβρακία). Arta is known for the medieval bridge over the Arachthos River. 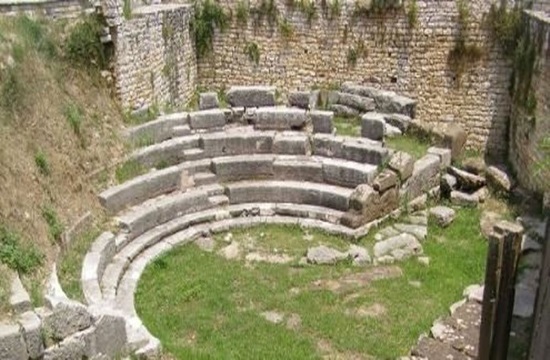 It is also known for its ancient sites from the era of Pyrrhus of Epirus and its well-preserved 13th-century castle. Arta's Byzantine history is reflected in its many Byzantine churches; perhaps the best known is the Panagia Paregoretissa (Mother of God the Consoling), built about 1290 by Despot Nikephoros I Komnenos Doukas. The first settlement in the area of the modern city dates to the 9th century B.C. Ambracia was founded as a Corinthian colony in the 7th century B.C. In 294 BC, after forty-three years of semi-autonomy under Macedonian suzerainty, Ambracia was given to Pyrrhus, king of the Molossians and of Epirus, who made it his capital, using Ambracia as a base to attack the Romans. Pyrrhus managed to achieve great but costly victories against the Romans, hence the phrase "Pyrrhic victory" which refers in particular to an exchange at the Battle of Asculum. Nevertheless, Pyrrhus found the time and means to adorn his capital with a palace, temples and theatres. In 146 BC, Ambracia became part of the Roman Republic.